The UPS/Overnite truck arrived at 11:45 am today to pick up the five Smart Vaults. They were fifteen minutes ahead of schedule and considering the icy roads and and the distance from the Richmond terminal, it was more than I expected. An earlier pickup was canceled by an ice storm, so I spent many hours clearing and salting the driveway in the hopes that we would have no problems today. My efforts were rewarded because the pickup went off without a hitch. The Smart Vaults are transported by UPS/Overnite which is a heads-up outfit with excellent equipment and capable people. Today’s pickup took only one hour and the heavy vaults were handled with great precision and skill. Compare that to your typical moving day scene in which the agony lasts for hours as you watch your possessions get manhandled by crews of questionable skill. My five vaults were taken to Richmond today and will be put into a double trailer for transport to the UPS/Overnite terminal in Charlotte, NC. Early next week the vaults will be loaded on a flatbed trailer with a forklift and delivered to our home site in Floyd. The elaborate routing is a result of legislation which limits the hours that a driver can spend on the road in one day. Three steps are required to get our vaults to a point 175 miles away. Smart Move has developed an interesting business model. 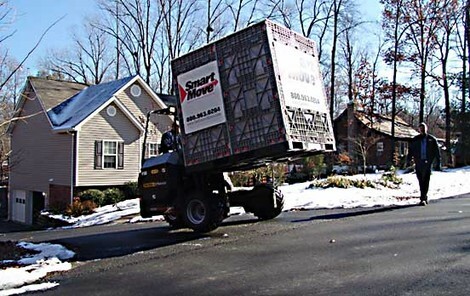 Smart Move is in the container rental business and has outsourced all of their transportation functions to UPS. It seems to give them a great deal of flexibility as they were able to service me when PODS could not. Based on our experience so far, I would recommend that anyone who needs a containerized move should check out Smart Move. The company website has a complete description of the services provided and I have found the company quite willing to extend their service area beyond what is currently listed. This company has also addressed one of the major nightmares of moving, finding where your household goods are at any moment. While in transit, each Smart Vault has the capability to be tracked via a Global Positioning Satellite (GAPS) unit. Tracking information for your containers is available on the Smart Move web site, so you always know where your goods are. They also track the shipment by the UPS Pro# or tracking number associated with your contract. Your shipment is tracked by both Smart Move and UPS/Overnite, so you always know where your good are located. We should see the vaults arrive on site December 21, weather permitting, which is fine by us because the hardwood flooring has not been installed yet. The vaults will sit in front of the new house until we call Smart Move to pick them up. Waving goodbye to the Smart Vaults was only one step of many that we need to complete before we can depart for our new home in Floyd. Our part of the closing happened this morning. We signed all of the documents at a title company just down the road. When the buyer signs the documents a few days from now, the title company will go into action registering the transaction and dispersing checks. We have more household goods to put in storage for transportation to Floyd at a later time. This is the 300 cubic foot overflow that I wrote about in an earlier post. I will probably rent a U-Haul truck and take it down in one trip. I have a few minor repairs to make on the house that were part of the sale contract. These will take less than a day, but had to be put off till the very end because one of them involves removing the cat door to the outside, which will drive the cats, and us, crazy. Last of all, we have to pack everything that we have to take with us in the two vans and a trailer. This includes cats, plants, food, clothes, towels, pots, pans, everything we will need until the vaults can be unpacked. The trailer will carry all of the gasoline-powered tools and everything that does not travel well in a closed vehicle. It should be quite an undertaking. Our current plans are to spend all day Saturday finishing up the last minute details of departing the house. On Sunday morning, we will point our caravan in a southwesterly direction and drive three hours to our new homestead in Floyd, near the Blue Ridge Parkway. To keep things interesting, I have learned from Doug Thompson that we should see a severe storm Sunday afternoon. Never a dull moment!